What happens with my personal data? Read here. 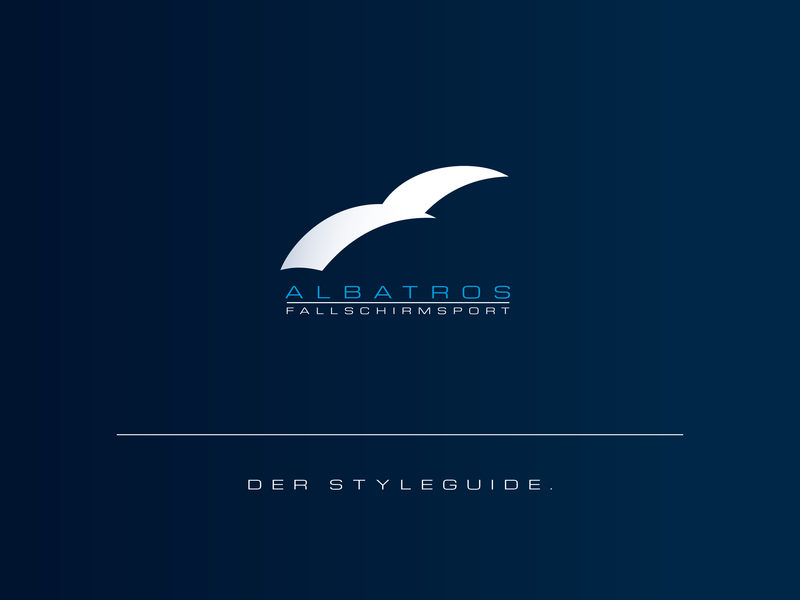 The Albatros Fallschirmport GmbH is one of Germany’s major provider and supplier for all needs concerning skydiving sports offering trainings and workshops for a broad public. It is also running Europe’s biggest online shop for professional supply in that area. Despite this fact Jörn Papke, the company’s CEO, one day came to us admitting to be very unhappy about the state of marketing measures and the overall house’s appearance in public. He was willing to take the next necessary steps but decided to give it a whole new basis. In contrast to many other design agencies we are not convinced about methods that tend to exclude the client from most of the creative processes and offer him only in the end the results of what claims to be our definite knowledge in that business. We love our work and are very passionate about its development in each singular case. Consequently we begin our research on a most broad range of possible directions. And from the start on we tend to let participate our clients in that matter. 03. 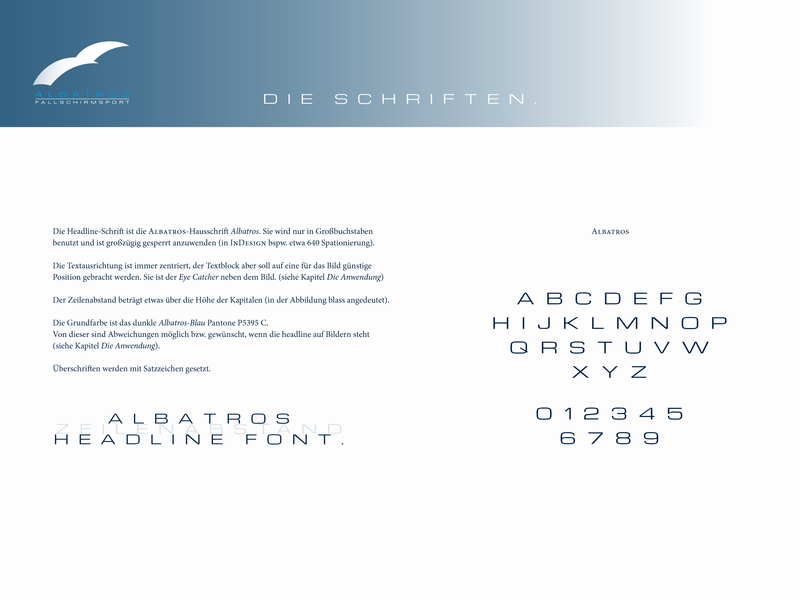 Albatros — The Idea. This helps us also to understand our clients preferences. Again we are not trying to persuade him of things that he intimately doesn’t like but aim at searching things that match his feelings, take him at the heart. And in our special case we intuited that it had to be something elegant. 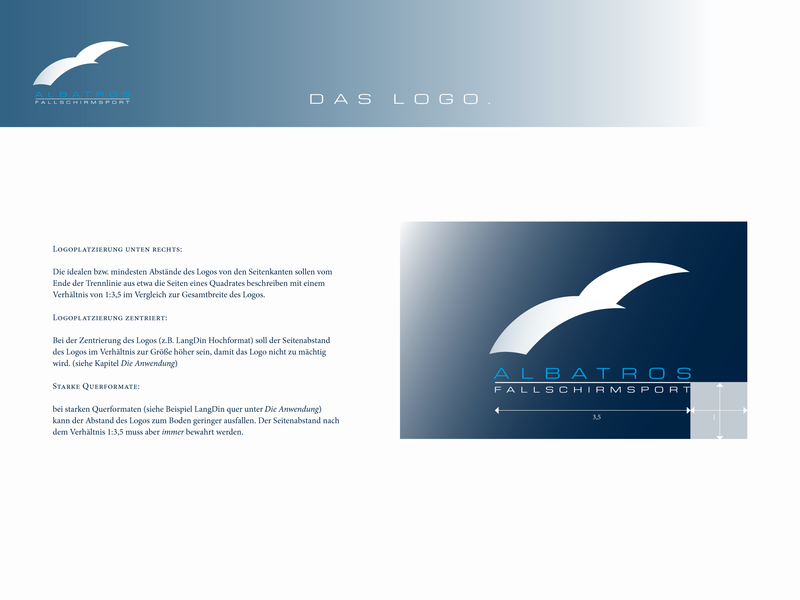 And well, the Albatros is a sea bird. So what might be closer than driving our perception towards something classy deep blue elegant and somehow almost understating? And consequently the wings of our signet bird were constructed out of two overlapping parachutes. From the begin on we integrate possible solutions into a wide field of adaptions and imaginary moods. Trying to tell how a webpage would look like or an advertising campaign would fit into the whole look. What color combination will be to prefer and what photographic style could match most? Our vision was that it had to be something atmospheric. 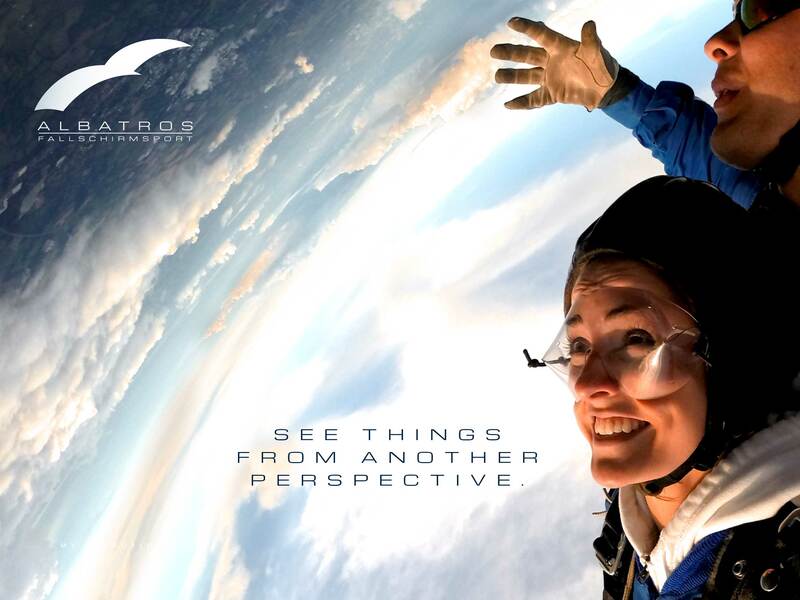 Putting the focus not only on the so called kick that might be produced during the skydiving experience in a second but on what will remain in a longer term. An overwhelming experience that might change your point of view forever. The Guide Book is what we will give in the hands of our clients. Gathering all the results, clearly defining all measurements and elements that endow the companies appearance. Define the colors, photographic styles and last but not least typographic refinement. In our particular case even a house typeface was created to make the perfect match with its logotype. Webfonts are served and we also supported the web design company handing out CSS sheets that precisely defined the design theme for webpage and online shop.